The Rangers inability to prevail in one-goal games was what separated the them from the Kings in last year’s Stanley Cup Final, but they have certainly turned the tables this season. New York will be looking to take a 2-0 lead over the visiting Tampa Bay Lightning in Monday’s Game 2 of the Eastern Conference final after eeking out a 2-1 victory in the series opener. The Rangers also managed to finally get one over Tampa Bay’s netminder Ben Bishop, who had won his first eight career starts against the club, but the Lightning coach Jon Cooper was more concerned regarding his team’s overall performance. “One team played like they’d been there before and the other one played like they hadn’t,” Cooper said. The Lightning are 8-2 in their last 10 games playing on 1 days rest but just 2-5 in their last 7 Conference Finals games. 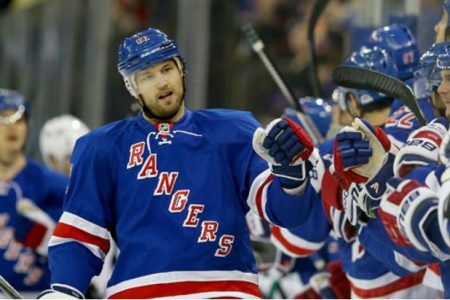 The Rangers are 5-2 in their last 7 Conference Finals games and 4-0 in their last 4 home games. The Rangers knows what it takes to navigate those close games in the playoffs. They have the routine and the quality and it would take close to a miracle for the Lightning to take a game at Madison Square Garden.